Watch the light-hearted new visuals now. Justin Timberlake has had a troubled relationship with the great outdoors in his Man Of The Woods album campaign. At first he seemed to embrace the elements wholeheartedly, only to then laugh off suggestions that he had gone full country. Now that the album is finally out he's done another 180 and released a tongue-in-cheek video for the title track. 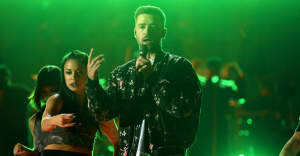 In the visual Timberlake runs through a forest to reach a log cabin for an old fashioned hoedown. There's also a little cameo from Jessica Biel, Timberlake's wife, who helps him pick out the perfect beanie hat to compliment his plaid shirt. You can check out the video in full above.